400 years since Shakespeare’s death, YA bestseller Malorie Blackman brings us Chasing the Stars, a novel inspired the bard’s play, Othello. Olivia and Aiden are alone on the long journey back to planet Earth. The ship’s crew, including their parents, was decimated by an unknown virus, leaving them to fend for themselves. When their ship picks up a distress beacon Olivia gives the orders to investigate and soon their home is packed with refugees desperate to get to safety, in the opposite direction from Earth. After saving their lives, Olivia finds herself blamed for the deaths of the people she couldn’t save and they even make moves to take the ship from her. At eighteen years old she may have been captain of the ship for years but they still see her as a child. Among the anger, hate and attempted mutiny there is one survivor that stands up for her, defends her and her brother. Nathan isn’t the same as the others, he grabs her attention just as much as she grabs his. But as Nathan and Olivia grow closer an evil haunts the ship and what first seems like a tragic accident reveals a murderer on board. First I should start with a confession, this is my first time reading Malorie Blackman. I know, I know, where have I been, what have I been doing, did my parents not love me? All good questions. When reading the best selling author who has received an OBE for her services to children’s literature, written over sixty books and was chosen as the Children’s Laureate from 2013-2015, you expect pretty big things…and Chasing the Stars delivers! Packed with action, twists and turns, murder, deceit and doomed love I devoured the almost five hundred pages of Chasing the Stars in two sittings. I’m not a fan of romance in general but Blackman’s unique take on the tragic love of Othello makes for great reading. Due to this being a relationship between young adults there is a fair amount of sexual content that would make it unsuitable for younger readers but even more relatable for teens. It’s a shame it still needs noting but it’s also great to read a strong, young, black female in science fiction (more of this please!). Also, massive bonus points for a War Games reference in the first chapter. 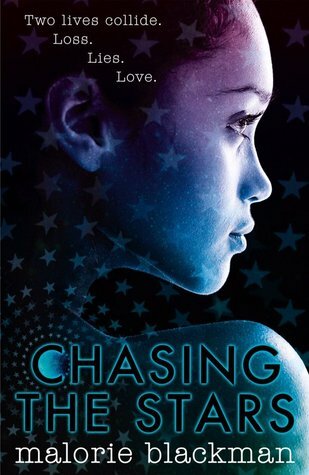 Chasing the Stars by Malorie Blackman is a great YA novel that is sure to delight her fans, make her a ton of new ones and encourage more than a few to pick up the original Othello. Read the first chapter of Chasing the Stars by Malorie Blackman at The Guardian here.